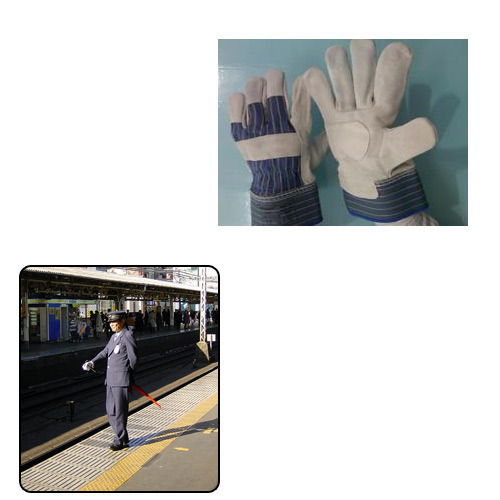 Our in-depth industrial experience enables us to manufacture and supply a large gamut of Leather Hand Gloves for Railway. Made from quality soft leather, these hand gloves are chemically treated and known for their fine finish. Our organization is engaged in offering a high performing array of Leather Hand Gloves to the clients. We, “ Terupati Engineering Works”, incepted in the year 2005 is reputed in its domain for offering products that are diverse in nature, yet are supplier, manufacturer, wholesaler & trader of wide range of Industrial Safety Products. We ensure our clients with best quality product that are crossed checked and delivered with in the given time line. We run standing business with an excellent reputation in our field with financially stable and efficient stock. The industrial safety equipment we manufacture are made using superior quality raw material that protects the users from all kinds of injuries. To carry out these tests, we have a well developed quality testing department that is manned by a team of expert professionals. Our years of experience in the relevant industry has enabled us to build wide network. We source our products from reliable vendors and deliver it to the clients in best competitive prices. We can get the products customized by our vendors to provide best services to the clients.